“Oi! Rise and shine,” said Maya as she pushed TJ’s snoring body with her foot. The big man ignored her and rolled over in his sleeping bag. “Where’s the snooze button,” he mumbled. The sun was pouring onto his face through the stone chamber’s single trapezoidal-shaped window. He put one of his arms over his eyes to block out the light. “Chasing llamas!” Maya repeated, half amused, half annoyed. The man knew how to get under her skin. But she needed him. She needed anyone who hated Ultratech as much as she did. “Meet me at the ruined gate in five minutes,” she ordered, striding out of the room. She made her way through the familiar maze of narrow streets of the City of Dawn—the ancient citadel where she, TJ, Orchid and Jago had been laying low for the last month. The remote mountain hideout had served for centuries as the Night Guard’s headquarters…until Ultratech had launched an attack a year ago, murdering all of Maya’s family and compatriots; and leaving her as the sole survivor and inheritor of a partially destroyed citadel. Holding out her right hand, she traced her fingers over the surface of the carved granite wall as she walked. She had grown up here, in happier times, with her sister Mira; and she knew practically every stone comprising the jigsaw puzzle pattern of the citadel’s many walls and structures. This place had been built with the blood and sweat of the indigenous people of the Andes, and she could feel their residual pain. Over five hundred years ago, the undead sorcerer Kan-Ra had arrived here on the run from his nemesis—the war golem Aganos. The Inca worshipped the mummified bodies of their ancestors, and so they had thought that the hideously decomposed Kan-Ra was one of their forefathers risen from the dead. The hateful sorcerer had reigned here for centuries—a petty tyrant in his own little kingdom. His slaves had carved the city’s stones—some of them weighing more than 50 tons—with Inca technology: nothing more than rocks and copper tools; but their expert stonework fit together so perfectly that not even the point of one of Maya’s daggers could slide between the cracks. Instinctively her hands went to the pommels of the golden daggers she always wore on her belt—the blades Temperance and Vengeance. These relics had been stolen by Kan-Ra from the Temple of Melqart in the city of Tyre during the reign of Alexander the Great; and he had brought them here, keeping them hidden in his storeroom of treasures. At first the enchanted daggers had nearly driven her mad: they had whispered to her in her thoughts, as though they were an angel and a devil sitting on either shoulder. Vengeance had called for her to seek bloody retribution for the deaths of her family and friends—to wipe out Ultratech and all of the modern-day monsters that it had created and unleashed upon the world. But Temperance had exuded a calming influence, urging her to use moderation and to act strategically. Over time she had learned to find a balance between these two voices; but now and again Vengeance filled her mind’s eye with visions of terrible violence. She paused in front of a pyramid-shaped temple, staring into a dark entrance and its flight of stairs leading down into the blackness. A thick damp musty smell emanated from the opening, punching her in the nostrils like a fist. The odor made her think of Kan-Ra and his decaying flesh. The sorcerer’s reign had finally come to an end when the original Night Guard had stormed the citadel and burned his body to ashes, imprisoning his spirit in a vault deep beneath this temple. After overthrowing the sorcerer, the monster hunters had made this citadel their headquarters, living here for over two hundred years; and Maya and her twin sister had been raised in the order under the tutelage of their family—all of whom were members of the Nigh Guard’s secretive order. The fraternal twins—Maya born with golden hair, Mira with black tresses—rose through the ranks to become two of the most skilled monster hunters who ever lived. But after Mira was lost on a disastrous mission to destroy a vampire coven in the Ural Mountains of Russia, Maya became unhinged and careless, drawing the attention of the sinister Ultratech—a megacorporation that regarded anything it could not control as a threat. Last year its forces attacked the citadel, and the spirit of Kan-Ra escaped from its prison in the chaos. “And it was all my fault,” Maya thought miserably. It had taken months for the distraught Maya to track down the sorcerer, guided by visions given to her by the daggers; for the relics were always seeking after their former master, and allowed her to see through his eyes, but at a great cost to her sanity. She had found Kan-Ra at his archive in the Sahara Desert; but she had found him too late. Using his dark arts, he had managed to regenerate a new physical form, and open a portal to another plane of existence. Maya had peered into that interdimensional gateway, and she had seen something that had tormented her night and day ever since: an evil winged beast bent on chaos and destruction. “O Diabo,” she said under her breath in Portuguese. The Devil. Or something very like that mythical fiend. After that last encounter with Kan-Ra, her ability to see through the sorcerer’s eyes had ceased, as if the invisible tethers connecting Temperance and Vengeance to him had been severed. She tore herself away from the gaping temple entrance and kept walking, arriving shortly at a collapsed archway made of cyclopean stones. She hesitated, staring at black scorch marks scarring the rocks. The City of Dawn had withstood over five hundred years of earthquakes with barely a fallen stone, only to be turned upside down by Ultratech’s attack force. What had once been the Night Guard’s thriving headquarters was now home to the local wildlife, herself, and the three other former Killer Instinct fighters. Maya had brought them together to help her bring down Ultratech. And they had come to the City of Dawn to hide out in the ruins—the last place that Maya reckoned the megacorp would search for them. Underneath the ruins stood what remained of the Night Guard’s high-tech facility, complete with a satellite monitoring control room, weapons caches, a small hospital and living quarters. Some of the equipment had survived the Ultratech onslaught, and Maya and her new companions had been hard at work getting things back online and operational, including the sentry guns that guarded the bastions. But the sensors for those auto-turrets were proving difficult to fix, which made them practically useless in the event of a sneak attack. Clambering to the top of the enormous fallen archway stones—each weighing as much as twenty elephants—Maya looked down upon a flat, grass-covered plaza below. Here the half-siblings Jago and Orchid were practicing their fighting skills on a plateau above the citadel’s reservoir. The brother and sister were training hard against one another: sword vs electric batons. Maya watched them for a while, mesmerized by their efforts, their shouts echoing against the walls of the pyramid-shaped temples that had been designed by Kan-Ra. A condor circled peacefully in the sky high above the nearby lake, unfazed by the noise of their exertions. Maya lifted her eyes to the snow covered peaks looming beyond the citadel. The Inca people, she had been taught as a child, used to believe that the mountains were siblings who communicated to each other with the sounds of thunder and lightning. Jago and Orchid were like these Andean gods incarnate. Maya turned and was surprised to see TJ standing behind her. The big African American man—a former heavyweight boxer—wasn’t exactly known for his stealthy maneuvers. He was wearing shorts, a ripped T-shirt with the words “Combo Gym” emblazoned on it, and a pair of boxer’s training gloves. Maya chewed on her lower lip. It had been two weeks since Thunder and Aganos had gone in search of Sabrewulf. Their mission had been to convince the werewolf to help them track down Kan-Ra. Maya had to find the sorcerer and force him to tell her the meaning of the vision she had seen in the portal—the vision that filled her with such foreboding. So much so that she was willing to put aside the death sentence the Night Guard had placed on the head of the last von Sabrewulf heir. “Vamos!” TJ said in Portuguese. They followed one of the old Inca messenger routes—a wide stairway made of inlaid stones—climbing up and up toward the snowy peaks standing sentinel above the City of Dawn. “Shouldn’t this be getting easier for me?” TJ asked after they had gone a quarter of a mile. He had fallen behind Maya by twenty steps and was breathing hard, but was still throwing practice punches at an imaginary opponent as he moved. She’d told TJ on their first run up this trail that, six hundred years ago, there were no horses in the Andes. So runners called chasquis brought information along the thousands of miles of paths built up and down the mountainous spine of the Inca Empire. A message—made up of a pattern of knots tied into woolen strings—could be carried two hundred miles in one day, passed from runner to runner waiting at relay stations. “Quit complaining,” snapped Maya. But she slowed down until TJ caught up to her. “Why do you do it?” asked TJ, wiping the sweat from his brow. “There is no weakness in Ultratech,” said TJ. “Anyone who thinks they are invulnerable will eventually fall,” said Maya. They climbed in silence for a while. Maya thought about what TJ had just said. For years Ultratech had claimed that the company was actually run by the artificial intelligence program known as ARIA; but Maya had always thought that this was merely a ploy—a smokescreen for a cabal of men and women working behind the scenes. Humans could be tried for human rights violations and white collar crimes. But what could the courts—or even the government—do to punish a program? Nothing. “So when you were experimented on at Ultratech, you never met someone in charge?” she asked. Maya touched the scarab jewel on her chest and scowled. It seemed ludicrous to think that a so-called “thinking computer” had caused so much evil. She glanced up and saw a condor high above them—so far up in the sky that now it was just a dark spec. “So why do you need to find Kan-Ra?” TJ asked. “I told you what I saw in the portal,” said Maya, pushing on faster. “Some kind of demon, right?” asked TJ, trying to catch up. They arrived at a flat spot on the switchback trail—a lookout that afforded a view of the City of Dawn below—and TJ halted, putting his hands on his knees, sucking in air. Maya reluctantly stopped alongside him, gazing into the distance. A bank of dark clouds had covered the mountain peaks in the west. She shuddered, feeling a strange sense of doom. “And what makes you…think that…Sabrewulf can help find Kan-Ra?” TJ asked between ragged gasps. “There is a relic amongst the von Sabrewulf horde,” said Maya, breathing normally. “It can track Kan-Ra. That’s why I asked Thunder and Aganos to go there. To search the secret library below his castle.” The Night Guard had worked with the von Sabrewulf’s since the mid-19th century, and she knew many of that family’s secrets. She gazed down at the citadel. From this height it looked like a model in a museum display. She could still see Jago and Orchid at their training, but they were the size of ants. A few llamas stood nearby the makeshift combat arena, chewing the grass, inured to the violent exercises that now took place in their home every day. “They never stop,” said TJ. “Jago and Orchid are preparing themselves for war,” said Maya. Maya smiled out of the side of her mouth. She could tell by the look on TJ’s face that he was teasing her. She liked the American despite his shortcomings. He was arrogant beyond compare, but she knew that in his heart he was a fighter who would never give up. She just had to keep pushing him. “Shall we go home?” she asked. “Perhaps we’ve had enough for the day.” She glanced up toward the sky where the condor had been circling and squinted at it. Were her eyes playing tricks on her? The condor seemed to be suspended in one spot. It wasn’t moving. Something wasn’t right. She shaded her eyes with her hand, scrutinizing the condor. It definitely seemed to be hovering in one spot. Her heart started beating faster. That was no bird. “TJ!” she screamed, turning to follow him up the path. But she stopped abruptly as a llama bolted around the switchback’s corner, racing past her down the steps, its eyes wide with blind terror. A split second later TJ appeared, flying down the stairs three steps at a time. Maya frantically pushed a sensor strapped to her wrist. Down in the citadel she heard the alarm klaxon blare out. The sentry guns were now activated. At least she hoped they were. “Run!” TJ bellowed, yanking her arm and pulling her after him. Maya was jerked along, almost falling flat on her face. But TJ grabbed her with his other hand, practically carrying her down the stairs. Glancing back over her shoulder Maya saw six Stalkers chasing after them, fire spitting from their mouths. 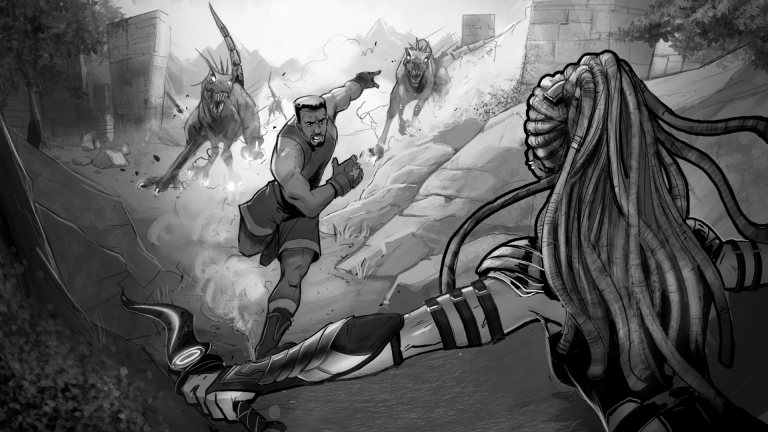 He turned on a dime and wheeled, throwing a wicked roundhouse that crushed the lead Stalker’s nose—a brutal punch that sent the dinosaur hybrid tumbling back into two of its sisters. Maya moved without thinking, leaping off the pathway and onto the steep mountainside, diving into the dense underbrush. She could hear one of the Stalkers right behind her—it had broken away from the pack to pursue her. She shot down the slope at breakneck speed, the Stalker’s fire burning her heels. It would soon be on top of her, bringing her down like a jungle cat on its prey. She tripped on a root and tumbled head over heels, over and over again down the steep hillside, finally coming to a stop flat on her back. The dinosaur leapt at her with its belly exposed. But Maya had unsheathed her daggers in her fall and she thrust them upwards. The golden knives dug into the Stalker’s flesh, and she gutted it like a fish from neck to tail with the force of its own momentum. The dinosaur landed with a thud and lay unmoving. Maya sprang to her feet and continued on, rushing through the bracken, heading down the mountainside toward the citadel. She heard a thunderous noise above and the sky went dark. Looking up she saw a massive Ultratech dropship passing over the citadel. One of the citadel’s heavy cannons erupted from the wall, shredding the U-ship’s tail rotor; and it spun wildly toward the ground in a death spiral as burning Stalkers leapt from its hatch. The vessel slammed into the side one of the temples with a massive explosion. “That’s one for the Night Guard,” Maya said, relieved the sentry guns had responded to her signal. She arrived at an irrigation canal, then sprinted along it toward the northern entrance—a post and lintel archway. One of the sentry guns popped up from its hidden alcove there, pointed right at her face and opened fire. She didn’t even have time to curse as tracers blazed past her head. She heard a wet sound of flesh being ripped apart right behind her. The gun stopped firing and Maya glanced back. The bullet-riddled corpse of a Stalker lay on the ground. Running under the archway and its smoking guns, Maya called up at the turret, “Good boy,” then headed toward the main courtyard, dashing through the opening and down a narrow lane, emerging onto the grassy plaza that was now slick with blood. Dead Stalkers and wrecked Mark 03 battle cyborgs lay everywhere, but the place was still crawling with invaders—twenty or more of the enemy combatants. Jago and Orchid were standing back to back a hundred meters away, valiantly fending off their attackers, but they were surrounded and woefully outnumbered. The sentry guns mounted on the walls were blazing away, but for every Stalker or cyborg that was destroyed, three more came to take their places. Half of the turrets had run out of ammunition and were now jerking back and forth like confused snake heads, searching for something to strike at. The sky erupted as a hail of missiles streamed down from the aerial destroyers above, silencing the last of the city’s defenses for good with a series of blasts that sent debris flying across the plaza. Maya covered her face as her body was pelted with stones. Something hit her in the mouth, cutting her lip. Then silence. The air was filled with acrid smoke. Ears ringing, Maya sprang to her feet, spat out a mouthful of blood, and stared into the thick dust clouding the air. Through the haze she could make out the dark silhouettes of Jago and Orchid, still standing back to back, and surrounded on all sides. Something barreled into her without warning, and she was hurled against a wall, her head cracking against the hard stone. She fell. Looking up, she saw that everything had gone blurry. She couldn’t tell if there was one cyborg standing in front of her or two, but the armored brute was charging its chest laser as it strode toward her, preparing to burn a hole in her brain. A figure leapt from the wall above, plowing into the cyborg’s torso with their knee and knocking it to the ground. It was TJ! He pounded the battle unit with his fists—a flurry of brutal combos—then ripped off the cyborg’s head in a shower of sparks, flinging it aside. Breathing hard he reached down and offered his hand to Maya. She saw that his face and chest were covered with blood. But thankfully it wasn’t his own. Maya grabbed his hand struggled to her feet. “You’re alive,” she said. They charged straight at the enemy, plowing through the Stalkers and cyborgs, punching and slashing a suicidal path to reach their companions. Jago cried out “Endukoken!” and a fireball erupted from his hands, billowing forth and incinerating a Stalker that was about to take down Maya from behind. “You should have run!” Orchid shouted at her. “We’ll die together!” cried Maya. “Dumb idea!” replied Orchid. “You should have run!” But the grateful look on her face belied her cynical words. Maya, TJ, Jago and Orchid stood with their backs to each other, making a square to fend off the horde. But there were too many of them…and more were coming. The sky was dark now, the sun blotted out by scores of Ultratech drop ships floating like evil black clouds over the citadel. Fury swelled in Maya’s heart as she hacked and slashed at the enemy fighters. She had been foolish to bring her companions here. She should have known that Ultratech would be watching. Screaming with rage, she stabbed a cyborg, ripping open its chest with her blades. Maya snapped her head around, taking in everything at once: Jago—on his back with a Stalker on top of him, its jaws snapping inches from his face. Orchid—trying to help her brother just as another dinosaur lashed her with its tail, flipping her off her feet. TJ—kneeling with one fist on the ground like a defeated boxer, blood gushing from his nose. At that moment a flash of red seared past Maya’s left eye and it was as if time stopped: she actually saw motes of dust caught in the laser’s beam. The next shot would kill her. There was nowhere to run. It was over. Maya fell to her knees and covered her ears in pain. The battle unit directly in front of her stopped in mid stride and froze. “What’s going on?” shouted TJ. Maya looked around. All of the Ultratech fighters had halted: the cyborgs standing like suits of empty armor; the Stalkers wide-eyed and breathing hard, but as stock-still as statues. The air reeked of the dinosaurs’ stinking breath, and the harsh chemical smell of cyborg fluid. A weird sound—like a stream of aural code—screeched from one of the Ultratech ships. The Stalkers blinked and shuddered, and the cyborgs’ eyes flashed. And then, in perfect unison, all of the dinosaurs and battle units turned and marched away as if obeying a summons. The hovering ships swooped down—the bottoms of their fuselages opening to reveal gangplanks. The Stalkers climbed back up these walkways and into their troop carriers, while the Mark 03s blasted into the air, their jet boots propelling them into the bellies of their ships. The entire retreat took less than two minutes. And finally, only one cyborg remained standing on the grass. It was staring at Orchid, as if unsure what to do. Then it suddenly blasted skyward, rocketing into a carrier’s hold, leaving behind nothing more than two smoldering burn marks on the grass. The fleet of ships rose higher and higher until they were above the clouds…and then disappeared. Ten seconds later, the first sonic boom pealed forth from the heavens, followed by another and then another. When the last carrier had blasted through the sound barrier, a profound silence descended upon the citadel—the only thing that could be heard was the wind whistling through the ruins. Jago sat on the ground in a daze. Orchid knelt by the burned grass where the cyborg had been. TJ stood staring at the sky with a stunned expression on his face. Maya sheathed her daggers, then clutched her trembling hands together to stop them from shaking uncontrollably. “I don’t get it,” said Orchid, mystified. “They…just ran away,” said TJ. “Something happened,” said Maya, staring at the distant bank of clouds. Just then the thunderheads parted to reveal the mountains to the west. Hovering over the far away peaks was a swirling darkness…as if the sky had been torn open to reveal a patch of night. Maya had witnessed something like this before: the portal that Kan-Ra had opened. But this one was much bigger; and it was exuding bolts of red lightning that licked the snowy mountain peaks like the tongues of a greedy monster. “It has come,” she said. ARIA stared out the Pinnacle windows at the swirling maelstrom—an anomaly the size of the state of New York—hovering three miles in the sky above the city. She had been analyzing it for 29 minutes and 37 seconds: ever since activating the Pinnacle Protocol—the order recalling all fighting units from the City of Dawn, and from other hotspots around the world, to come back and protect the headquarters of Ultratech. The instant the chaos whirlpool had first manifested in the sky—spewing forth elements that Ultratech instruments were unable to identify—ARIA had known that this was some sort of portal forged by a being from another dimension. She also knew that whatever was on the other side of that portal was not benevolent. One did not dig a hole through the fabric of space and time merely to say hello. The recent emissions from the portal—lightning that seared the ground, altering matter and corrupting it by breaking down its molecular structure—gave chilling proof to that theory. Something was beginning to reform the Earth. “What do you suggest we do?” said ARIA. “Your humor is inappropriate,” replied ARIA. “I wasn’t joking” said Cinder. “I will bring them an olive branch,” said ARIA. ARIA started walking out of the Pinnacle, heading for her node-alcove. She would download into another frame at an Ultratech facility in South America, and fly to the Night Guard headquarters in a U-ship. She estimated she would be face to face with Maya and the others in 21 minutes and 45 seconds. “The Alliance,” said ARIA as the Pinnacle’s blast doors closed behind her. “Boring!” called out Cinder. And then, for lack of anything better to do at the end of the world, he went and sat down on ARIA’s throne. “Hmm. Not quite as comfortable as I had always imagined,” he said to the empty chamber.